Taktsang Dzong: Situated on the edge of a 900 meter (3,000 feet) cliff, the Taktsang Monastery or Tiger’s Nest creates an impressive sight, and is the unofficial symbol of Bhutan. It is about 2-3 hour, totally up-hill hike from the parking lot to the temple. 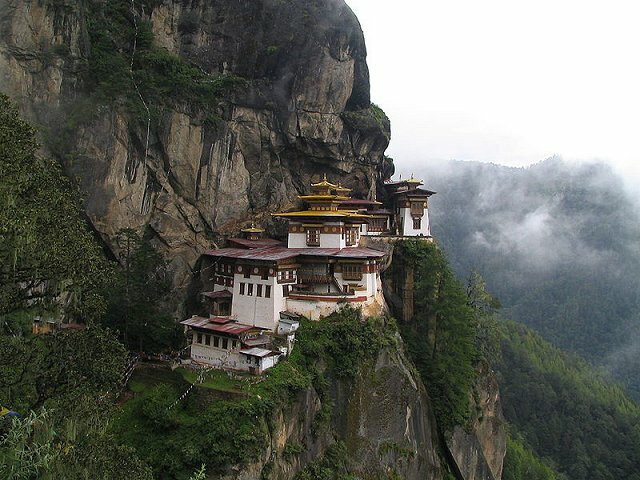 The original monastery was constructed in the 17th century but most of its buildings were destroyed in a tragic fire in 1998. Since then the temple has been painstakingly restored to its former glory. 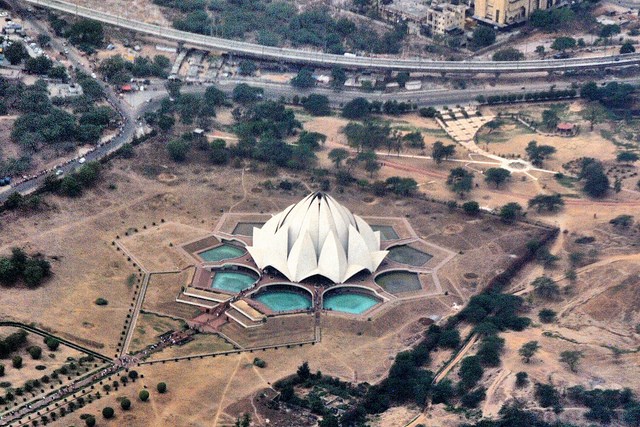 Lotus Temple: Known as the Lotus Temple due to its flowerlike shape, the Bahá’í House of Worship is the most famous temple of the Bahá’í Faith. The lotus shape of the temple is formed by 27 free-standing marble clad petals arranged in clusters of three to form nine sides. Since its opening in 1986 it has become one of Delhi’s most visited buildings. The lush park around is well landscaped but mostly off-limits. 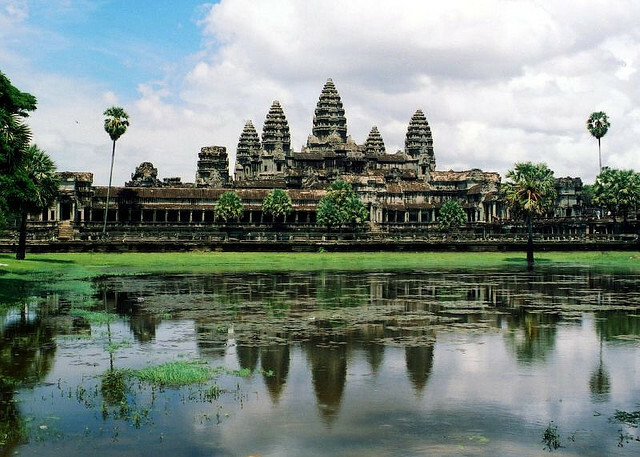 Angkor Wat (”City Temple”) is a vast temple complex at Angkor, built for king Suryavarman II in the early 12th century as his state temple and capital city. The Angkor temple stands on a raised terrace above the rest of the city. It is made of three rectangular galleries rising to a central tower, each level higher than the last. It is the only temple at Angkor to have remained a religious centre since its construction, first as a Hindu temple then as a Buddhist temple. Borobudur: Located on the Indonesian island of Java, 40 km (25 miles) northwest of Yogyakarta, the Borobudur is the largest and most famous Buddhist temple in Indonesia. 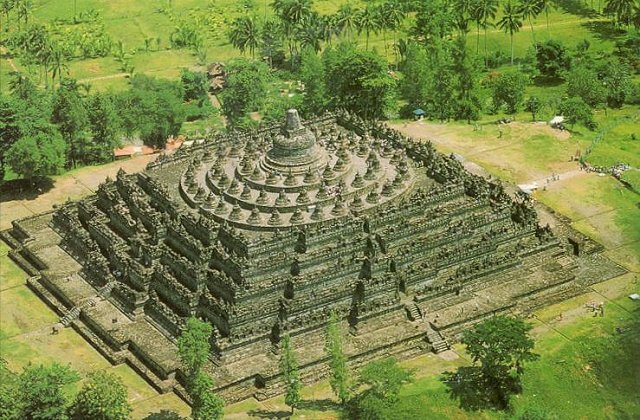 The Borobudur was built over a period of some 75 years in the 8th and 9th centuries by the kingdom of Sailendra, out of an estimated 2 million blocks of stone. It was abandoned in the 14th century for reasons that still remain a mystery and for centuries lay hidden in the jungle under layers of volcanic ash. 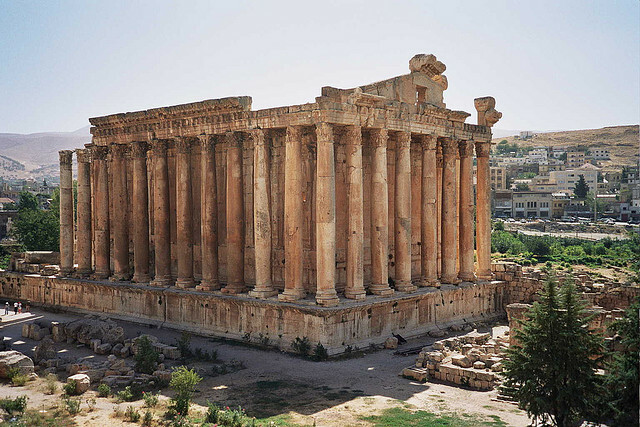 Baalbek: Baalbek is a spectacular archaeological site in northeastern Lebanon. From the 1st century BC and over a period of two centuries, the Romans built three temples here: Jupiter, Bacchus and Venus. Created to be the largest temple in the Roman empire, the temple of Jupiter was lined by 54 massive granite columns each of which were 21 meters (70 feet) tall. Only 6 of these colossal columns remain standing but even they are incredibly impressive. The best preserved temple at the site is the Temple of Bacchus built in 150 AD. 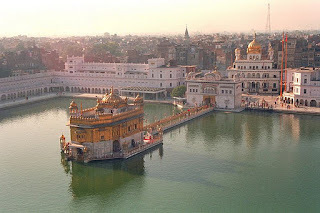 Harmandir Sahib: The Harmandir Sahib, better known as the Golden Temple is the main attraction in Amritsar, and the most important religious place to the Sikhs. Construction of the famous temple was begun by Guru Ram Dast in the 16th century and completed by his successor Guru Arjan. In the 19th century, Maharaja Ranjit Singh covered the upper floors of the temple with gold, which gives it its distinctive appearance and English name. It’s a stunning temple, and always full of thousands of pilgrims from all over India, excited to be at a place that they usually only see on television. 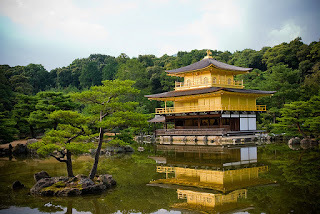 Golden Pavilion: Kinkaku-ji or the Temple of the Golden Pavilion is the most popular tourist attraction in Kyoto. 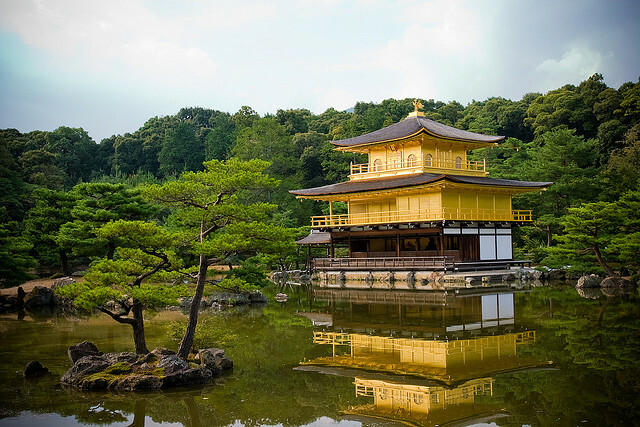 The pavilion was originally built as a retirement villa for Shogun Ashikaga Yoshimitsu in the late 14th century, and converted into a Zen temple by his son. Unfortunately, the pavilion was burnt down in 1950 by a young monk who had become obsessed with it. Five years later, the temple was rebuilt as an exact copy of the original. The beautiful landscaping and the reflection of the famous temple on the face of the water make for a striking sight. 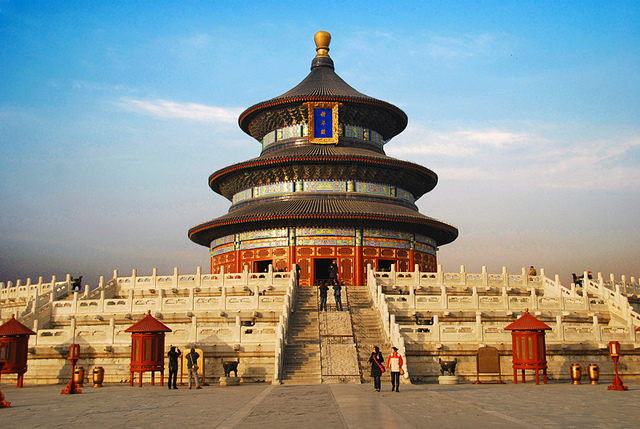 Temple of Heaven: The Temple of Heaven in Beijing is regarded as a Taoist Temple although Chinese Heaven worship pre-dates Taoism. The temple was constructed from 1406 to 1420 during the reign of the Yongle Emperor, who was also responsible for the construction of the Forbidden City in Beijing. Not only a beautiful sight, the temple is also surrounded by a vast public park popular with local residents practicing tai chi in the mornings and on weekends. 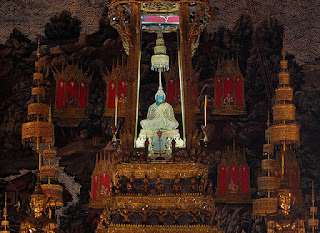 Temple of the Emerald Buddha: The Wat Phra Kaew or Temple of the Emerald Buddha is a famous temple in Bangkok, located within the grounds of the Grand Palace. 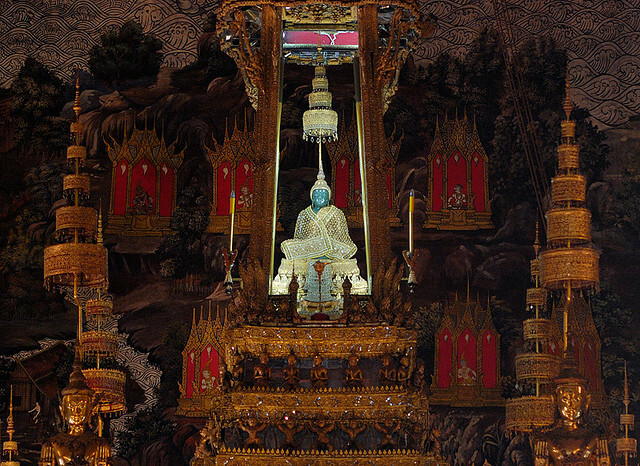 The main building is the central ubosoth, which houses The Emerald Buddha. A jade statue adorned in gold clothing it is one of the oldest and most famous Buddha statues in the world. 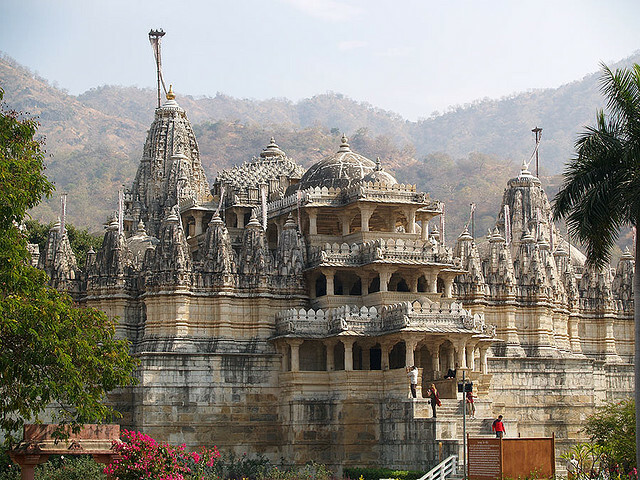 Ranakpur Temple: Dedicated to Adinatha, the Jain Temple in Ranakpur rises majestically from the slope of a hill. The temple is supported by over 1444 marble pillars, carved in exquisite detail. The pillars are all differently carved and no two pillars are the same. The construction of the temple and quadrupled image symbolize the Tirthankara’s conquest of the four cardinal directions and hence the cosmos. The dating of this temple is controversial but it was probably built between the late 14th and mid-15th centuries.